A captivating adventure with a dash of romance and magic. 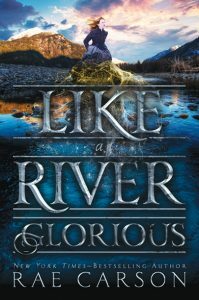 ‘Golden Goddess’ Leah Westfall faces her past head on as tension intensifies in Rae Carson’s highly anticipated Like A River Glorious—the second book in the Gold Seer trilogy. We catch up with Leah (Lee) again—the girl who divines gold, who senses it thrumming beneath the earth and buzzing under her skin. Her magical ability makes her a highly sought after target during the 1840s Gold Rush era, particularly for her money-hungry, murderous Uncle Hiram who will stop at nothing to have her in his clutches. Lee, her long-time best friend and crush Jefferson, and a crew of friends she’s made along the treacherous trail, look for land to claim as their own, to prospect and flourish in a new America. Using her gold sense as guide, Lee finds promising land for them all until as expected, trouble finds them just as their future seems to shine brightly. Hopes and dreams for a peaceful life burn to embers and Leah realizes she must reveal her closely guarded secret if she is to put her friends in danger time and time again. But when Lee chooses to face Hiram, she finds herself in more peril than she anticipated, in a place that is more horrible than she thought. While there, however, she discovers the full extent of her power, the undisputable depravity of her uncle and the power of friendship, hope and love. The story shines some light on the cost of Western expansion during this time including enslavement and the claiming and destruction of Native American land. Lee’s plight unravels amidst these atrocities, portraying the many who hoped to escape and find a new life for themselves. Rae Carson’s rich, descriptive storytelling captivates once more with a story shaped by adventure, romance, friendship and a little bit of magic.